Advances in Ophthalmology and Optometry reviews the most current practices in both ophthalmology and optometry. 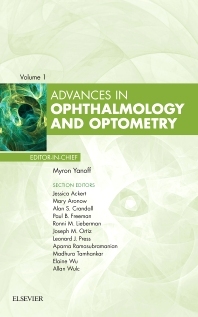 A distinguished editorial board, headed by Dr. Myron Yanoff, identifies key areas of major progress and controversy and invites expert ophthalmologists and Optometrists to contribute original articles devoted to these topics. These insightful overviews bring concepts to a clinical level and explore their everyday impact on patient care. Topics will cover all specialty areas, highlighting the most current and relevant information in the field.